PETALING JAYA,: With the pilot project of the elevated Bus Rapid Transit (BRT) Sunway Line set to be operational by June 9 this year, Prasarana Malaysia Bhd (Prasarana) says more can be expected to be built at various locations in the future. Prasarana's Group Chairman Tan Sri Ismail Adam said being a breakthrough in Malaysia's public transport system, the BRT will set the standard for other similar projects in this country. "The government wants to have more of the BRT system at various locations," he told a media briefing here today on the BRT Sunway Line project. The BRT Sunway Line is a public-private partnership project by Prasarana and Sunway Bhd, to provide an integrated transport access to over 500,000 residents at Bandar Sunway and Subang Jaya. The project which costs RM634 million is 70 per cent funded by Prasarana, 15 per cent by Sunway Bhd and the rest by Unit Kerjasama Awam Swasta (UKAS), a facilitation fund. "This BRT can be considered the first elevated version in Southeast Asia. "It is currently 90 per cent complete and we target to make it fully operational before June 9," said Ismail. The project was launched by Prime Minister Datuk Seri Najib Tun Razak on June 9, 2012. Ismail explained that the BRT is an alternative solution to an area that has no access to the light railway transit (LRT) system or other rail services. It has dedicated busways, an integrated pedestrian access, universal access facilities, bicycle racks and a rapid boarding facility to serve high service frequency. 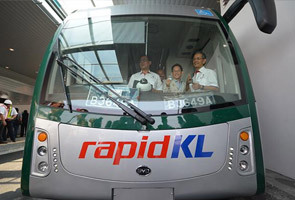 Meanwhile, Prasarana's Group Managing Director, Azmi Abdul Aziz said the BRT offered park and ride facilities, with 1153 car parking bays, and will use 15 electric buses to connect all its seven stations, while moving between the USJ 7 LRT and Setia Jaya Komuter Stations. The ridership is forecasted at 2,400 pax per hour for 2015 and reach 5,200 pax per hour in 2035, said Azmi, who has been the project manager for the venture since its inception. "The National Land Public Transport Master Plan shows that 12 more BRT are set to be built. "They are planned at areas identified as having desperately high demand and without access to planned systems, such as in Ampang, Melawati, Subang and Kepong. "However, the Land Public Transport Commission and the government will decide on building future BRTs," he told Bernama.